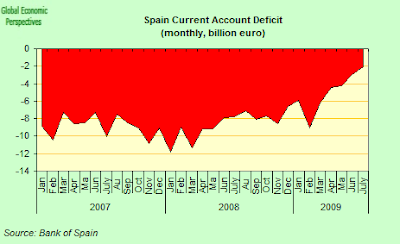 Spain's current account deficit fell to 2.064 billion euros in July from 7.752 billion euros a year earlier as imports tumbled, according to the latest Bank of Spain data. 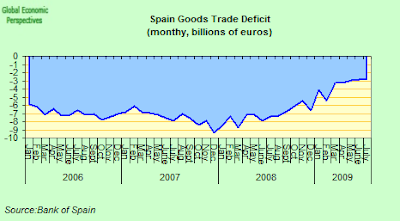 This is a very sharp and dramatic fall, and my guess is that at this rate the gap will close in six months or so, which will be a very strong correction, and potentially very painful for Spanish living standards. 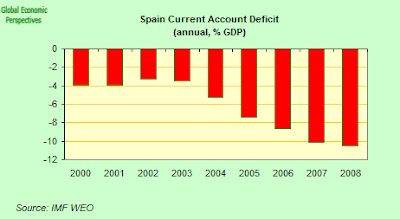 In fact the Spanish current account deficit ballooned in the "good years" - from around 3% of GDP at the turn of the century, to around 10% in 2008 on the back of large external borrowing to acquire housing units and land, and the inevitable imports which were sucked in to fuel the consumption boom. The main reason for the fall was the reduction in the trade deficit, as imports plummeted an annual 29.5 percent amid weak domestic demand, while exports fell a lesser 15.8 percent. 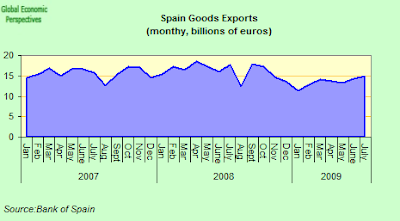 As Dominic Bryant, Chief European Economist at PNB Paribas puts it - "The 4.2% fall in GDP tells only half the story. 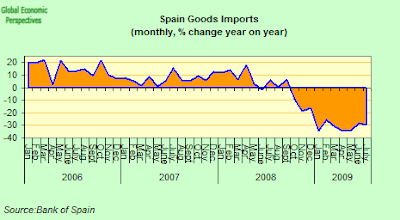 Final domestic demand has dropped by about 7.5% – the only reason GDP held up was because the collapse in domestic demand led to a 22.3% fall in imports" (Quarterly data from Q2) . That is, the drop in living standrads is actually much sharper than headline GDP numbers actually show. And this is with a government running a fiscal deficit of 10% of GDP plus this year. Heaven knows what the fall would have been without this. 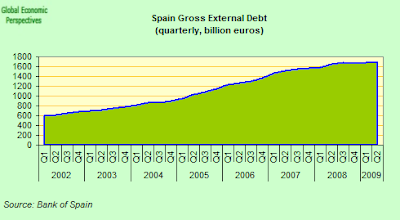 Also included in this series is one of the key charts of the present spanish crisis, gross external debt - now at roughly 158% of GDP, and of course rising as GDP falls. 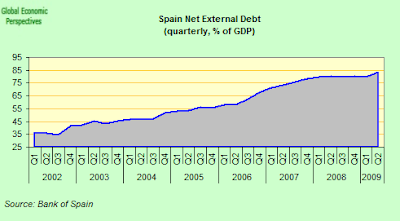 The net debt chart illustrates quite clearly why the ability to issue debt denominated in your own currency is one of the most treasured possesions of any sovereign state. 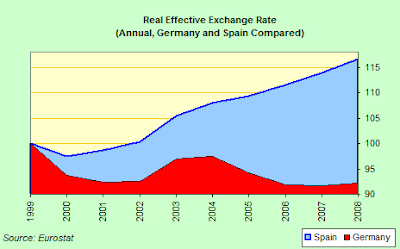 Basically Spain's debt is in euros, and since the Spanish treasury and central bank have no capacity to create euros, or to devalue the currency, the only way to correct Spain's distortions is via and long slow and hard process of ideflation (also known by the more politically correct title of internal devaluation, which doesn't make it any easier or less painful as we can see now in Latvia). 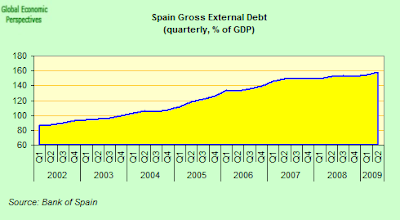 But this is just the problem, since with deflation the external debt to GDP ratio will rise - that is Spain will become MORE indebted, and this is just one of the unfortunate consequences of having gotten to where Spain has now arrived. 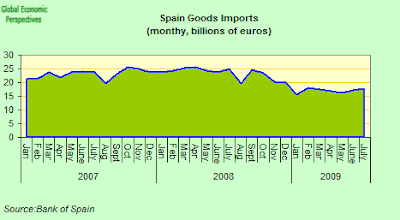 Chief IMF Economist Oliver Blanchard said yesterday that the Fund now expect Spain to return to growth in 2011. I'd like to know where he thinks the growth is going to come from, quite frankly I really would. 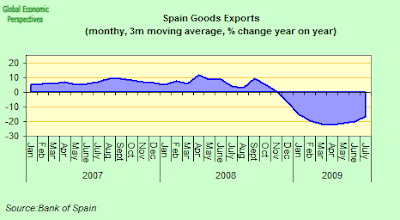 I don't see any sustainable return to growth till Spain's export industries become competitive again. In the best of cases we will simply sink to the bottom, and stay there in an "L" shaped recovery, while the banks steadily blow up one after another under the weight of the mounting pile of non performing loans. 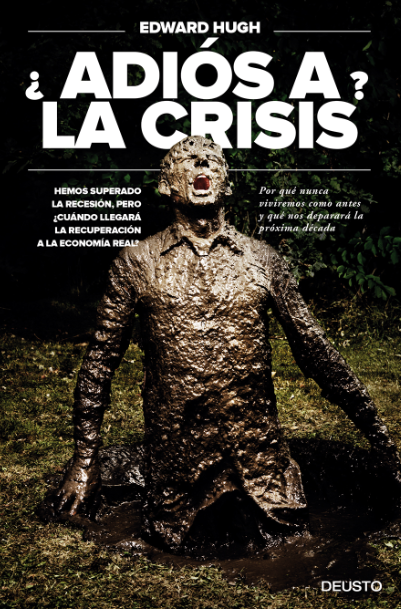 And of course, we may not get the best of cases, since the worst thing about a financial crisis, is that when a country enters one the cost of servicing the debt (interest payments) also rises, as credit downgrades come, and investors demand more risk premium. This is what normally sends a country spiralling out of control once a critical threshold has been triggered. 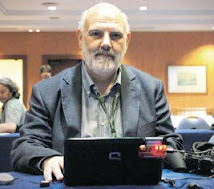 Spain, of course, can't be that far from this threshold at this point, which is why it would be better that those in Brussels and Frankfurt who can see this should be doing something now to grab Spain's administration firmly by the scruff of the neck in order to move things in another direction before the inevitable happens. 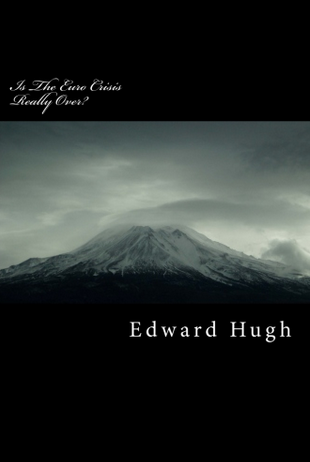 Or does the ECB plan to keep vitual quantitative easing - Japan style - running as far ahead as the eye can see?